The TradeWinds DIY recumbent tandem bike mixes a short wheelbase recumbent bike with a long wheelbase recumbent bike to create a compact and speedy tandem recumbent bike that is both fun and efficient to ride. You can build this sporty DIY tandem recumbent bike using our easy-to-follow plan, utilizing old bike parts and thin walled steel tubing. All of the parts required can be salvaged from old bicycles. All you need is a few old bike frames and some thin walled steel tubing in order to create your own DIY Tandem Recumbent Bike. Our plans will show you how ti chop and weld, salvaging what you need from discarded or yard sale bikes. Comfortable Recumbent Seating For Long Rides. 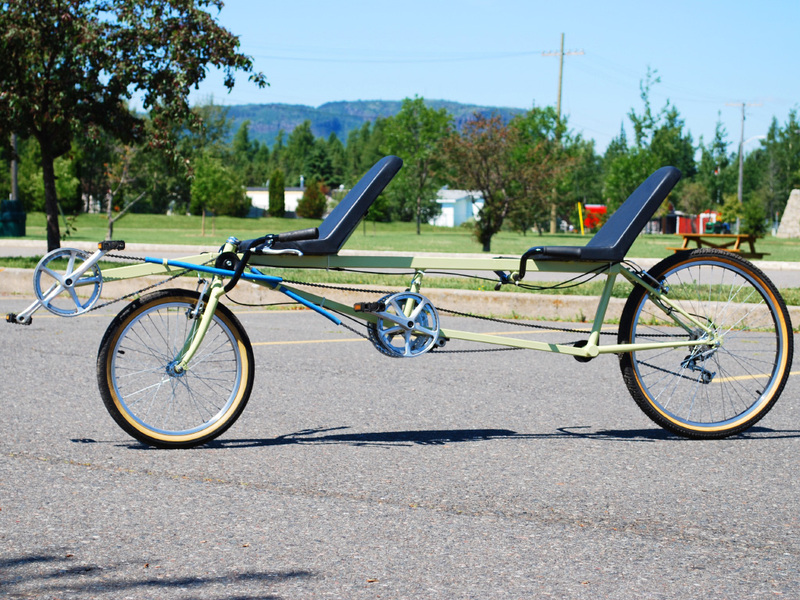 The pilot controls all shifting and braking, so a single rider can also use this DIY recumbent tandem bike. Enjoy the view on a recumbent bike. The frame is made from mild steel square tubing, so it is easy to cut and weld, requiring only a hand held angle grinder or hacksaw. All of the transmission parts are salvaged from old biocycles or can be purchased now from any bike shop. Efficient Power With Two Human Engines. Put those old bikes to good use. Even if you have never welded or tried building a bike, our plans will guide you through the entire building process with step by step highly detailed photos and text. 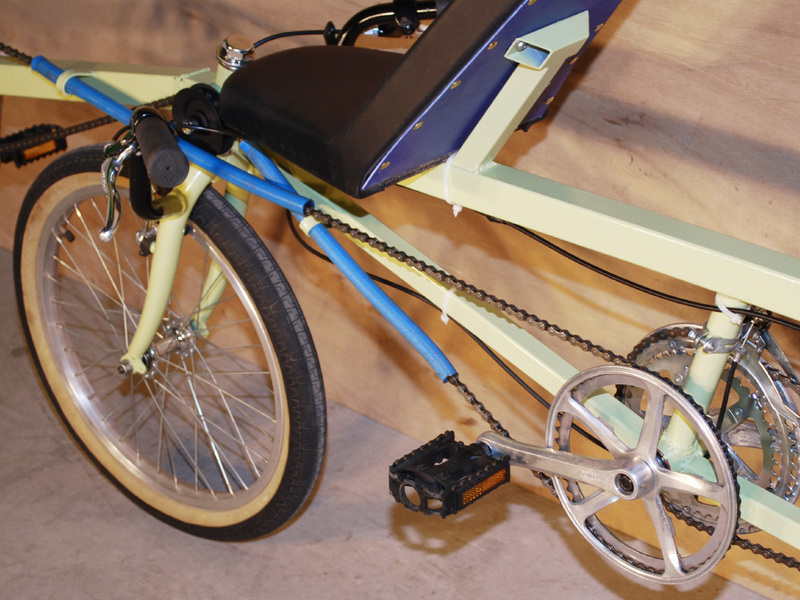 Anyone can follow our plans and create a great looking functional tandem recumbent bike. The relaxed and comfortable recumbent seating position allows for a painless extended commute and lets both riders enjoy the scenery without having to strain to look forward. Having a full back support also allows the riders to push their energy directly into the cranks to deliver that needed boost of power to sprint or climb hills efficiently. Two human engines on one bike means great efficiency. It is easy to modify old bicycle components into something new, and the skills you will learn will allow you to create all kinds of different bikes and trikes as you continue this fun hobby. Tell all your friends to give you their scrap bikes instead of taking them to the dump. 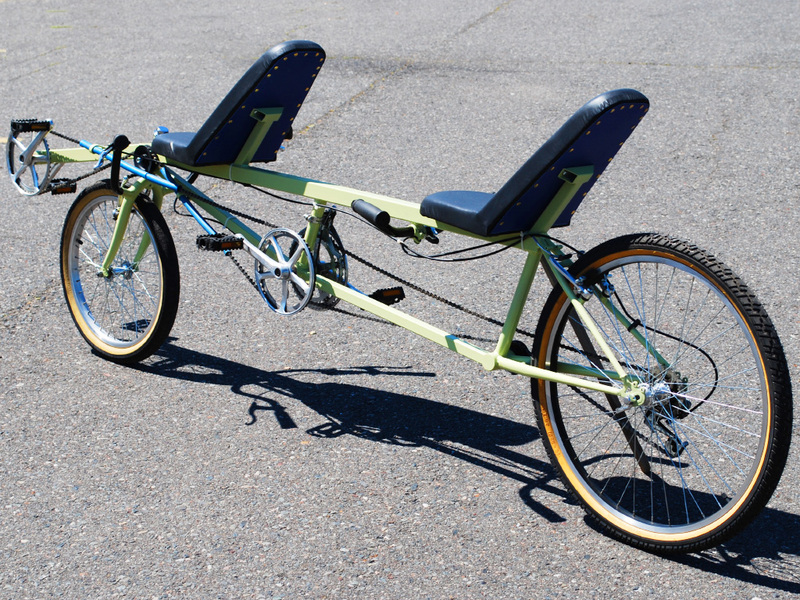 Add Your Own Modifications For a Unique DIY Tandem. Learning to ride our DIY recumbent tandem is easy and you will find the efficiency of two sets of legs working a single bike to be extremely good for sprinting and hill climbing. There is plenty of room for modification in our DIY bike plans, so you can alter the original design and create something unique using the parts you have available. 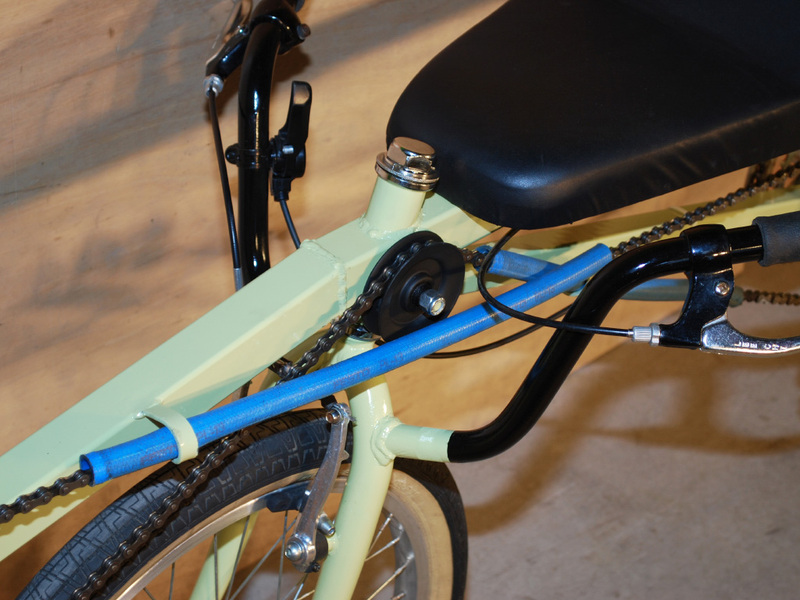 Only common bicycle parts are used, and the the frame is made from basic steel square tubing. We are all about recycle and reuse, so the Delta Trike Plan encourages using the parts you have on hand, as well as salvaging bicycle components from old unused frames when you have them. You can build a beautiful DIY Tandem bike just like this one for a fraction of the cost of a commercial trike, even if you use many new components. There is a great pride that comes from DIY! Under seat steering places your hands in a comfortable and natural position so you can ride all day long. All of the levers and shifters are placed within reach on the handlebars, so your DIY tandem bike will operate like any regular bicycle. Since all of the transmission components are salvaged from a regular bicycle, you can add as many speeds as you like. Don't worry about the condition of the bikes you are using for parts, this plan will show you how to clean them up so they function like new again. 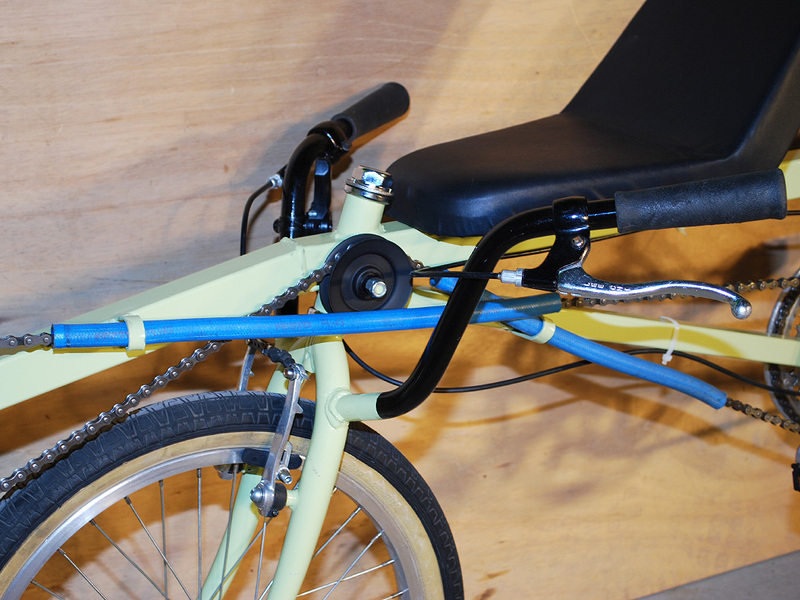 Even the seat is made using only plywood, foam, and vynyl, so you can build this tandem bike on a small budget. 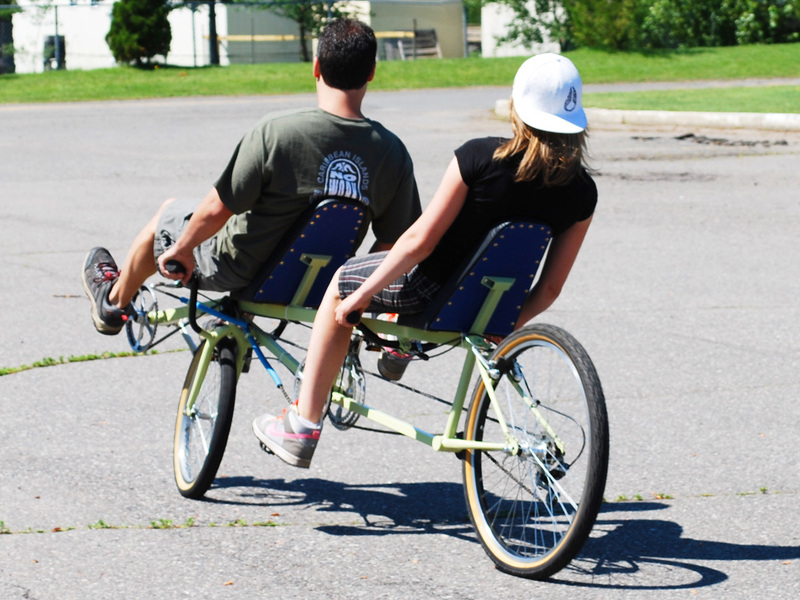 Enjoy a Fun Ride on Your DIY Recumbent Tandem Bike. 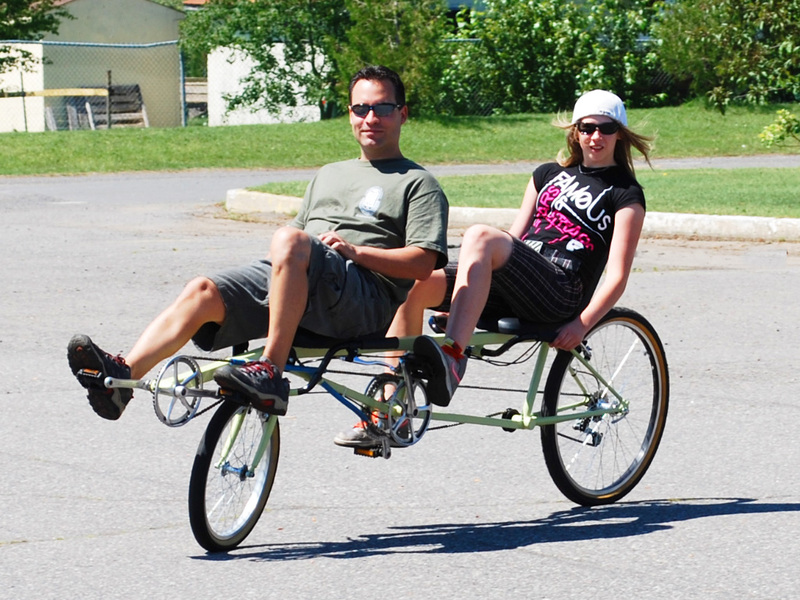 We design our plans so that anyone with a desire to build can make their own great looking DIY tandem recumbent bike. Every single step of the build is shown in great detail, and the plans assume you have only the basic tools such as a hand drill, angle grinder, and a any basic welder. Build this tandem bike on a budget by recycling those old bikes sitting in the back of the garage into something new and fun to ride. There is plenty of room for your own modifications such as a power assist motor or cargo space under the rear seat. The easy to make square tube frame allows for easy modifications and addons, so let your creativity run wild. Every single step is shown in high detail using many photos and clear text, so you can create your own recumbent tandem bike in minimal time using inexpensive bicycle components. You can easily modify the bike to suit your needs, making a completely unique DIY recumbent inline tandem of your own design. Enjoy a long country ride with your partner on this comfortable and efficient tandem. 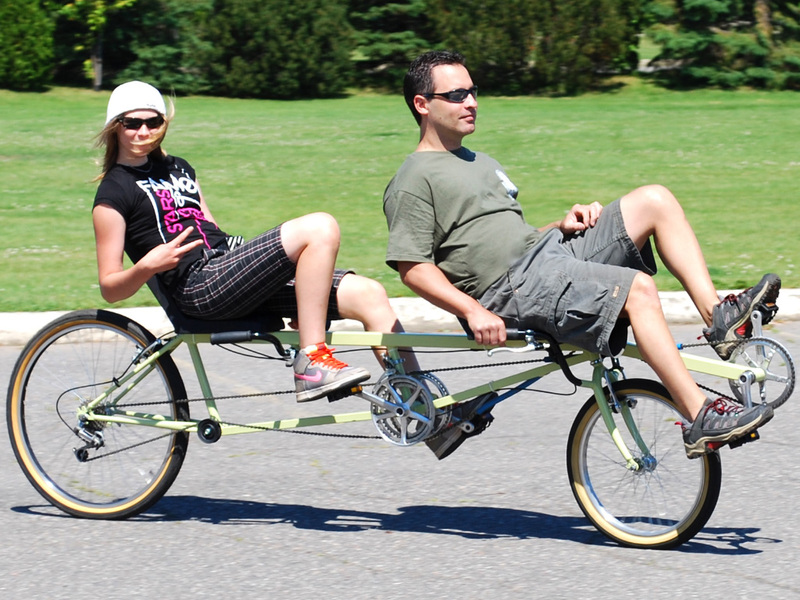 Enjoy a fun team effort ride on our Atomic Zombie easy-to-build DIY recumbent tandem bike plan, and create something using minimal tools and inexpensive components. Every single step is shown in high detail using many photos and clear text, so you can create your own recumbent tandem bike in minimal time using inexpensive bicycle components. Enjoy the fresh air with your partner on a fun to ride and fast tandem recumbent bike.